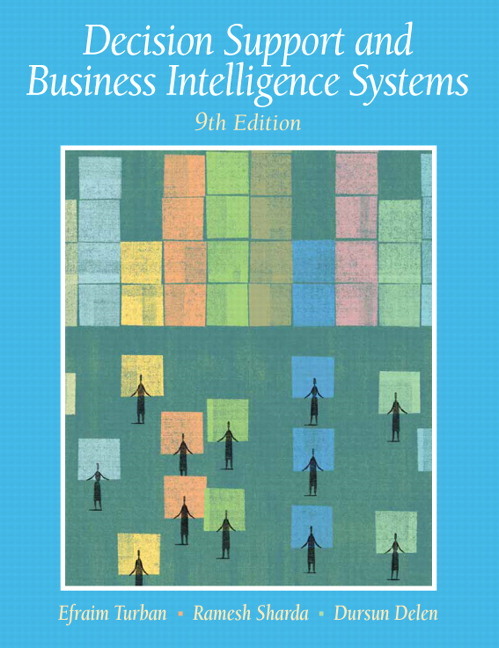 Decision Support and Business Intelligence Systems 9e provides the only comprehensive, up-to-date guide to today's revolutionary management support system technologies, and showcases how they can be used for better decision-making. • Introduction of management support systems (MSS) technologies. The ninth edition concentrate on three main areas: BI, data mining, and automated decision support (ADS). • BI and analytics for enterprise decision support. In addition to traditional decision support applications, this edition promotes students’ understanding of the Web by providing examples, products, services, and exercises and by discussing Web-related issues throughout the text. Web intelligence/Web analytics are highlighted, which parallel BI/business analytics (BA) for e-commerce and other Web applications. • Extensive supply chain and ERP coverage. Detailed coverage of decision support in supply chain and ERP applications helps students address the crucial supply chain and logistics questions that enterprises focus on. • Comprehensive coverage of data warehousing. Coverage of topics such as warehouse access, analysis, mining, visualization, and modeling introduces students to state-of-the-art solutions for the entire data warehouse lifecycle. • Comprehensive coverage of knowledge-based decision support. All the techniques students will need to build advanced knowledge-based decision support systems are covered—knowledge acquisition and representation, inference techniques, and intelligent systems development. • Organizational and societal impacts. By learning about the organizational and societal implications of advanced decision support technology, students gain a grasp on the ethics, politics, and other non-technical issues associated with electronic decision support. • Detailed coverage of implementation and integration. The coverage of the real-world challenges of integrating new decision support tools into existing technical and business infrastructures gives students insight into the issues that will make or break their decision support projects. • Links to Teradata University Network (TUN). Most chapters include links to TUN (www.teradatauniversitynetwork.com). The student side of the Teradata site (Teradata Student Network [TSN]; www.teradatastudentnetwork.com) mainly includes assignments for students. A visit to TSN allows students to read cases, view Web seminars, answer questions, search material, and more. The TUN website provides software support at no charge. It also provides links to free data mining and other software. In addition, the site provides exercises in the use of such software. • Streamlined Coverage. By retaining only the most commonly used content, the book is now more concise. Rather than preformatted online content, a Website provides updated content and links on a regular basis. The number of references in each chapter is reduced. Deleting Chapter 5, and instead putting some content in Chapter 1, streamlines the introductory coverage of business intelligence and data mining. With this change, the reader can get an overview of the overall content through Chapter 1 – both decision support and business intelligence technologies. This overview can prepare a student to begin thinking about a term project in either area (should the instructor require it) right from the beginning of the term. 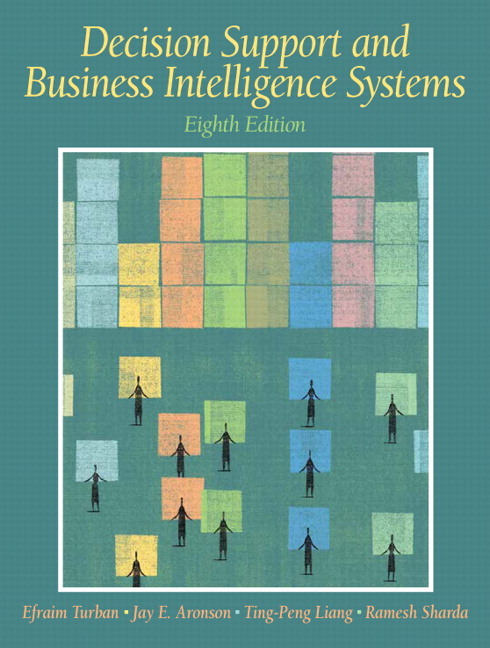 Then the details of decision support systems are covered in Chapters 2-4, and business intelligence topics begin with Chapter 5. The chapters available as online chapters with the last edition were deleted, with some content incorporated in this edition directly. • A Live Update Website. Adopters of the textbook have access to a Website that includes links to new stories, software, tutorials, and even youtube videos related to topics covered in the book. With continuous updates, students will be able to access the very latest information. • New Author Team. This edition includes one new author and an expanded role for an author from the last edition. Building upon the excellent content that has been prepared by the authors of the previous edition (Turban, Aronson, Liang, and Sharda), this edition was revised primarily by Ramesh Sharda and Dursun Delen. Both Ramesh and Dursun have worked extensively in DSS and data mining areas and have industry as well as research experience. Dave King (JDA Systems), a co-author of The Strategy Gap (a book on corporate performance management) contributed Chapter 9: Business Performance Management. • All New Figures. All the figures are redrawn to be more contemporary and consistent in style. These are available in color for use in PowerPoint slides through the online image library. • Revised and Updated Content. Almost all of the chapters have new opening vignettes and closing cases based upon recent stories and events. Application cases throughout the book now include recent examples of applications of a specific technique/model. New website links are included throughout the book. Many older product links and references are deleted. Finally, most chapters have new exercises, internet assignments, and discussion questions throughout. • The Planners Lab software. Chapter 3 includes a major DSS software section to introduce The Planners Lab software, which builds upon a DSS software that was very popular in the 80s and 90s. The PC-based version of the software is available for free to academics. A concise introduction to this software and several exercises help students learn to use DSS builder software. Dr. Jerry Wagner of University of Nebraska-Omaha, and the founder of The Planners Lab contributed this section. • F ewer Boxes, Better Organized. Important material was incorporated within the text, reducing the number of boxes by more than half. Only two types of boxes now exist: Application Cases and Technology Insights. o Chapter 4 has brief coverage of analytic hierarchy process (AHP) and also introduces some free/inexpensive pair wise ratings software that students can use. All Microsoft Excel related coverage is updated to work with Microsoft Excel 2007.
o Chapter 5 presents in-depth, comprehensive coverage of data mining using a methodical approach resembling the standardized data mining project process. This chapter is entirely rewritten to make it easier to digest information source for data mining. Specifically, it excludes text and Web mining (covered in a separate chapter), and significantly expands on the data mining methods and methodologies. o Chapter 6 provides detailed coverage on artificial neural networks and their use in managerial decision-making. The most popular ANN architectures are described in detail. A new section on explanation of ANN models via sensitivity analysis has been added to this chapter. o Chapters 8, 10, 11-13 include new technology insights, application cases, and updated text. For example, Chapter 13 now includes coverage of some new techniques such as fuzzy inference systems, support vector machines and intelligent agents. o Chapter 9 is now the new chapter combining material from multiple chapters in the previous edition. Besides streamlining and updating the coverage through a new opening vignette, a new closing case and discussions throughout, it includes new sections on KPIs and Operational Metrics, Lean Six Sigma, Payoff of Six Sigma, and a section on BPM Architecture.